Alejandro Hurtado joined Celta Vigo after leaving Chicago Fire in 2031. At that time Hurtado believed joining Vigo was the best step towards managing his favoured club Sevilla. But what happened over the next eight years led to a Champions League title push with Vigo as thoughts of managing Sevilla left the Chilean managers mind. This post will take us through Hurtado’s seasons with Galician club Vigo and look at some of the finest moments of his managerial career. If you aren’t yet up to date with the series, follow the link below where you will find all VivaGlobetrotting posts in chronological order. Alejandro Hurtado joined Vigo in the 2030/31 season with just 3 games to go in La Liga. Vigo sat 14th when Hurtado joined and would definitely finish between 12th and 15th. Vigo remained unbeaten for the final 3 matches as they overtook Real Betis to finish in 13th. In our first full season with Celta Vigo we led our new side to an 8th place finish, ending just 1 win away from continental football next year. We were in a battle for European football until 1 win from 13 matches meant we dropped out of the running for Europe. Things took a downward turn in Hurtado’s second full season in charge of Vigo as they finished 10th in La Liga. 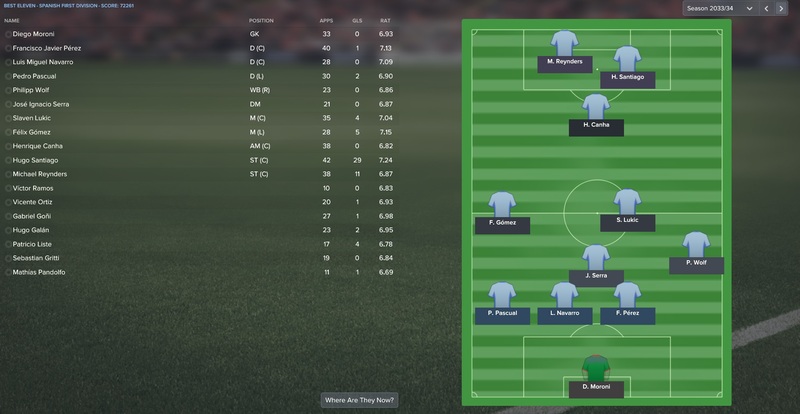 Our formation changed as we bought in top-scorer striker Patricio Liste. 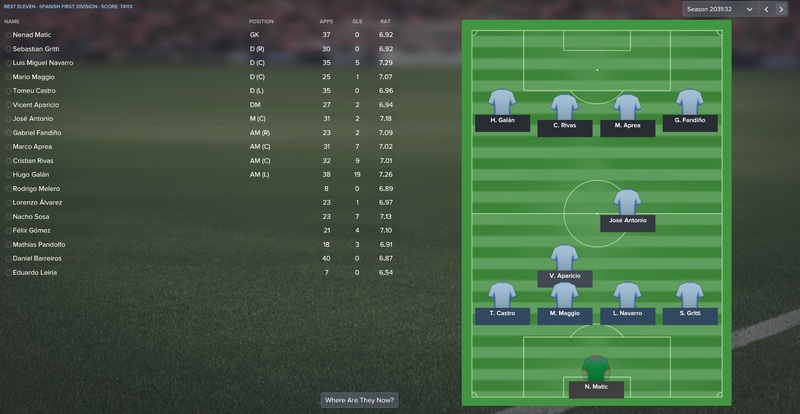 In our third year with Celta Vigo we managed a 5th place finish in La Liga. It all came down to the final day but we were lucky enough to secure continental qualification. As you can see, we moved to a 2-striker system after seeing the development of Hugo Santiago and having signed Michael Reynders. Europa League qualification the previous year could have seen us focus on Europe and settle for another 5th or 6th place finish this season. However a very strong season allowed us to finish in 4th and qualify for our first season of Champions League football. 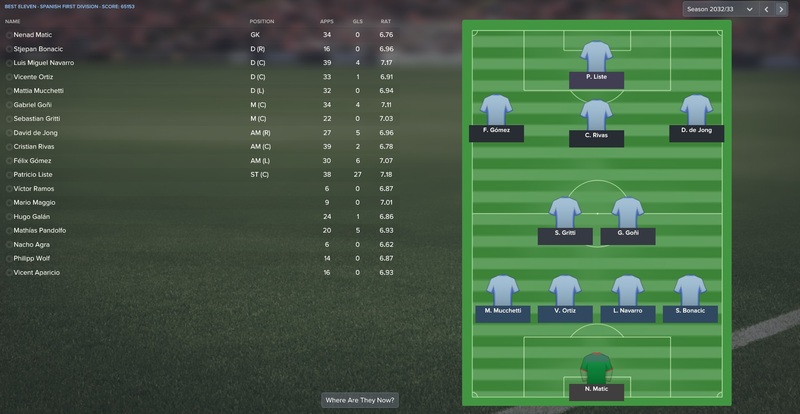 We retained the same formation as last year and the consistency has allowed us to perfect the tactic. Both Santiago and Reynders scored 20+ goals over the year. 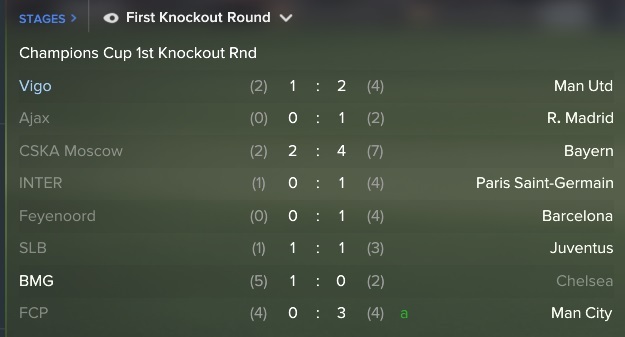 In our first season in Europe, we progressed through to the knockout rounds only to lose to Portuguese side Sporting Lisbon. Yet another progression, this time Vigo finished 3rd in La Liga. Consistent Champions League qualifications will really help our club progress into one of the best sides in Europe. For the first time with Celta Vigo, we have decided to play without wingers. Instead we will look to beat teams through the middle with our strong central players. The money brought in through the Henrique Canha deal (£95M to be exact) has been reinvested in bringing in several high quality players. 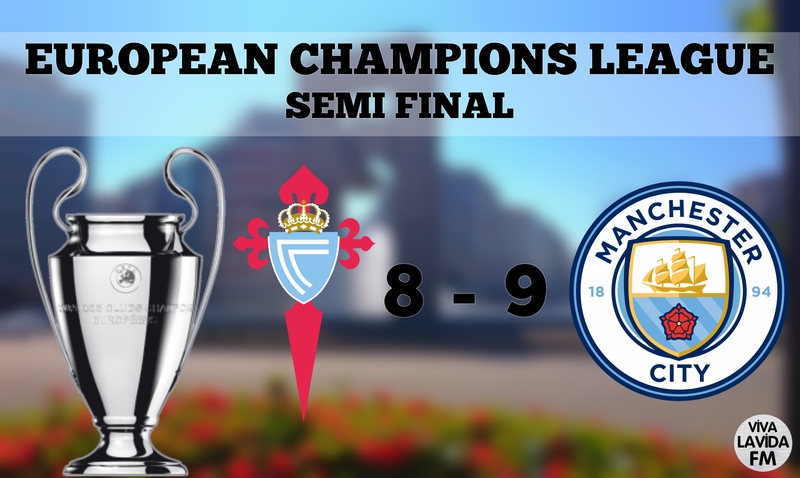 Our first season in the Champions League saw us reach the Quarter Finals before being knocked out against Manchester City. We did win our first piece of silverware since joining Celta Vigo as we lifted the Copa del Rey. 5th place should be looked at as an unsuccessful season after the previous two years. Yet have attained the same number of points two years ago, and just two fewer than last season, you could say we are fairly unlucky to finish outside of the Champions League qualification places. This is the third season in a row in which both of our strikers have scored 20 or more goals, highlighting our attacking prowess. It is defensively in which we need to improve. 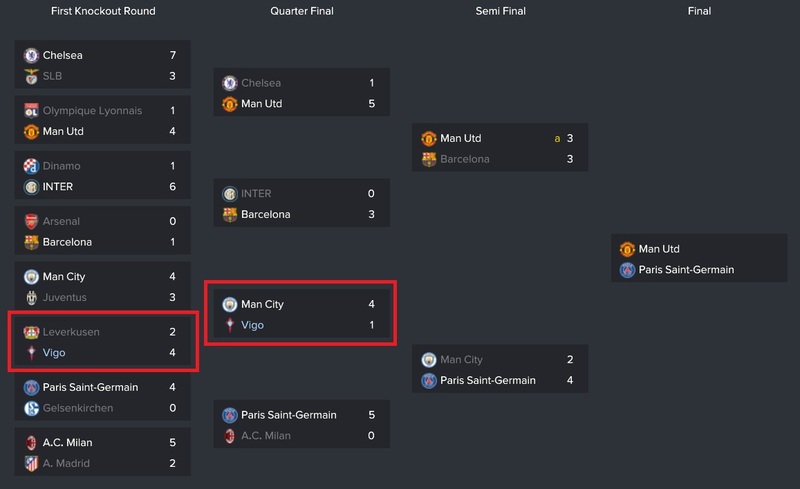 Unable to repeat, or better, the performance in last years competition, Vigo crashed out of the Champions League in the first knockout round, this time against Manchester United. Our penultimate season in charge of Celta Vigo saw us finish in 4th place with our highest points tally of 72. This is an impressive 12 points clear of 5th place. We are really starting to show a Madrid-esque style of attacking dominance. Three of our strikers scored 20+ goals and even our 4th striker scored 15. Seriously impressive attacking from Hurtado’s Vigo. Back in the Europa League, a competition in which we had targeted for a potential trophy, Vigo lost out to Italian team Fiorentina. A bitter blow in our pursuit of continental success. We also lost in the Copa del Rey final. Our only saving grace was our Champions League qualification through our league placing. Our final season in charge of Celta Vigo saw us finish in 4th place yet again. We won just 65 points which, in some seasons, could have seen us finish lower. However an incredibly strong season for the top three, winning 96, 95 and 89 points respectively, meant that we were never really challenging for the title. 3 players with 20+ goals, Hugo Santiago with 44. We can be very proud of the strength of our narrow, attacking 4-3-1-2. 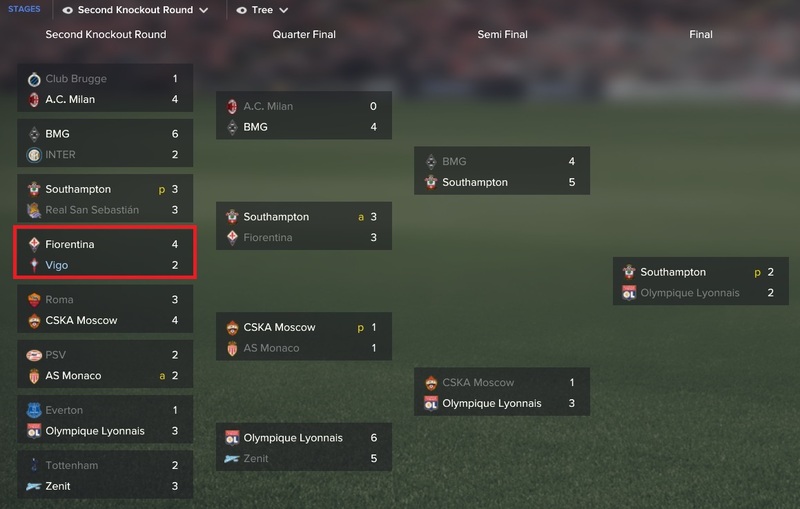 An incredible run to the Semi-Finals of the Champions League saw Alejandro Hurtado being labelled as a footballing genius. Despite all of the media attention his side were unable to overcome English giants Man City, losing 9-8 over two legs. Our season, and career with Vigo, did end with some success as we lifted the Copa del Rey for the second time. 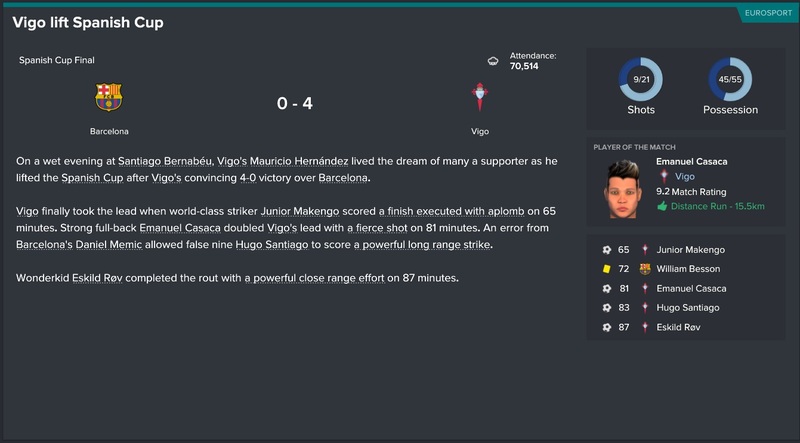 We thrashed Barcelona 4-0 to confirm our status as one of Spain’s best clubs. Unquestionably the star of our career with Vigo, and debatably the star of our entire series, is Spaniard Hugo Santiago. The Galician player came through the youth academy at Vigo and has thrived under the leadership of Alejandro Hurtado. He has, quite easily, become Vigo’s all-time leading goalscorer and at the age of 24 he will hopefully go on to score many, many more. Celta Vigo are not considered a club with worldwide reputation. Their growth can be seen in their value, having been worth £57M in 2031 they are now valued at £366M. It is also pleasing to see that Sevilla have become a competitive rival. Perhaps Hurtado’s history with them has attributed to this. In red we can see the records that have been broken since Alejandro Hurtado joined the Galician club. 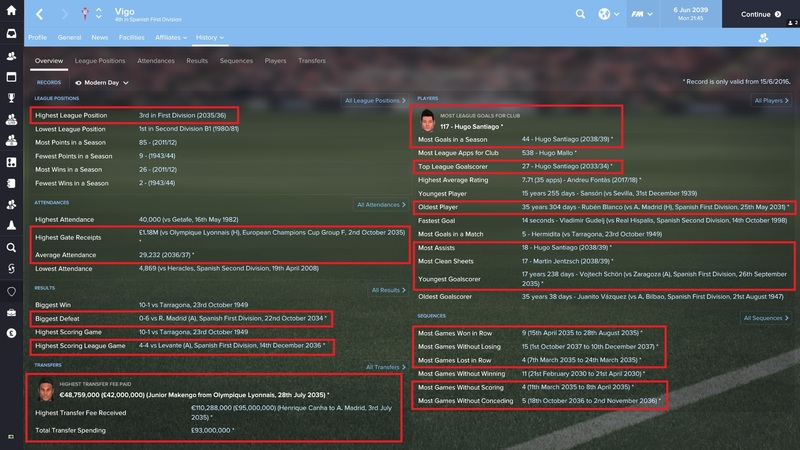 Most notably are the highest ever league position (3rd) and most league goals for the club (Hugo Santiago). Alejandro Hurtado leaves Celta Vigo having managed them for over 400 matches. He will forever hold the Galician club in his heart. But it is time to move on to something new. Thanks for reading our VivaGlobetrotting Celta Vigo review. Alongside our stint with Union San Felipe, Vigo has produced some of our greatest moments of FM17 so far. And with a new series starring Federico Hurtado (son of Alejandro) coming soon, more magical moments are surely on the horizon. If you enjoyed this post, please do share it around and be sure to follow us through the links above. 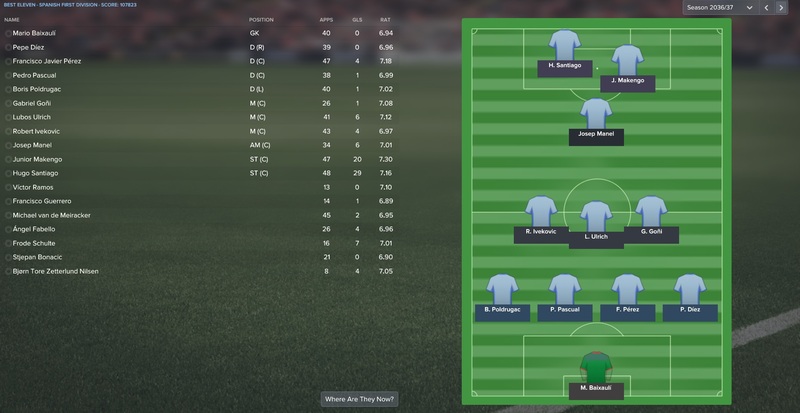 This entry was posted in FM17 Stories, Football Manager 2017, VivaG Spain, VivaGlobetrotting and tagged alejandro hurtado, celta vigo, champions league, copa del rey, europa league, europe, fm stories, fm17, football manager, la liga, VivaG Spain. Bookmark the permalink.